Starting from October 9 till October 31, 2010, in the frames of Programme No 16, in Kim?/FK gallery a photo exhibition by Reinis Hofmanis “Sale” will be opened for visitors. What is it, that’s put on sale? And why? Land, home, or something else? 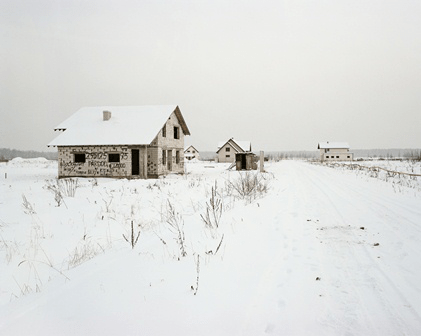 In the new series of photos by Reinis Hofmanis it’s just vaguely apprehensible. Works of this sequence have been created in a period of two years, but the exposed pictures have been captured during the previous winter. Although so far it has not been typical for the author, these pictures lack the presence of people; what’s left of them, is the impact on the environment, together with the wish, whish, so simply written down in one word “Pārdod” / “Sale”. Documentary attitude prevails in these photos – the artist has chosen the exact situation and shots, most characteristic for it – never constructing the landscape artificially, leaving its composition unaffected. Reinis Hofmanis (1985), photographer and a graphic designer. Graduated from the Art Academy of Latvia, department of Visual Communication (VKN); has studied in Hannover University of Applied Sciences and Arts. His presence in the field of Latvian photography started with the series titled “The Model” (2009), about which Maija Rudovska, the art scientist, writes: “Reinis has created the serie of photos “The Model” with a sensitiveness, discretion and reverence. (..) In his photos, Reinis has reached something more distant than just an association “model – object”, which we are used to spot in the studio works of artists.” (Rudovska, M. Reinis Hofmanis. Starp dokumentalitāti un inscenētu kadru. ( In Between Documenta and A Staged Shot) Foto Kvartāls, Nr. 6(20), 2009, 8.lpp.). Later, from January till April 2011, this series of photos will be exposed in the 15th Tallinn Print Triennial, where the theme of this year is “For Love Not Money”.